Australia’s victory over England at the Sydney Football Stadium on 27 July 1991 is the greatest performance by a Wallaby team in Australian rugby history. This England rugby union team that toured Australia won the 1991 Five Nations championship, claiming the Grand Slam along with it. “Australia played possibly the best eighty minutes of Rugby I have ever seen an Australian team play,” former Australian coach Bob Dwyer wrote in The Winning Way. Australian vice-captain Michael Lynagh would later call it the benchmark for Australia’s World Cup assault later that year. Australia fielded the same side that had defeated Wales 63-6 the week prior, with the exception of Simon Poidevin, who replaced Jeff Miller. Jeff Miller was awarded the Players’ man of the match for the Wallabies’ Test against Wales the week prior. The Australian vice-captain and Queensland captain Michael Lynagh uncharacteristically went public, criticising Wallaby coach Bob Dwyer for his shock omission of Miller. Queensland lock Rod McCall also spoke out against Dwyer’s dropping of Miller. “He [Miller] performed mighty deeds against Wales last Sunday,” Gordon Bray noted at the commencement of the broadcast. Dwyer later explained the rationale behind his shock omission. Poidevin’s selection meant that he would be playing his first Test for the Wallabies since the one-off 1989 Bledisloe Cup Test in Auckland. Perhaps the most significant thing about Australia’s forward pack was that, with Miller’s omission, it contained no players from the 1989 British Lions series. Meanwhile, the England side contained four forwards who played in the Lions series – Brian Moore, Paul Ackford, Mike Teague and Dean Richards (Wade Dooley was unfortunately injured for this Test). England contained 12 players from the 1991 Five Nation champion Grand Slam team. Fullback Jonathan Webb and winger Chris Oti obtained selection due to good form on tour. Martin Bayfield, standing at 208cm tall, replaced the injured Wade Dooley for his second Test cap. Rory Underwood took the field as England’s most capped rugby player ever, after surpassing Tony Neary’s record in Suva against Fiji just prior to this Test. It must be remarked how wonderful it was that this Test was played at the Sydney Cricket Ground. Just prior to kick-off the Australian crowd of just under 40,000 gave a powerful rendition of Advance Australia Fair, and one received a real sense that the Wallabies were playing at the real spiritual home of Australian rugby. Australia opened the scoring in the opening stages of the Test when Michael Lynagh kicked a penalty. England scrumhalf Richard Hill was penalised in the fifth minute for being offside near a ruck close to the English try-line, creeping well ahead of the last English feet. Lynagh kicked a difficult penalty from the sideline in the sixth minute to give the Wallabies a 3-0 lead. In the 11th minute of the Test, Australia had the scrum feed on the English quarter-line. Farr-Jones executed a “box-kick” in the direction of English winger Rory Underwood. Underwood and Egerton contested the ball. The ball bounced off Egerton and into the hands of Australian eightman Tim Gavin, who happened to be in the right place down the sideline. 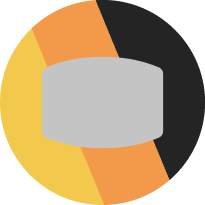 Gavin ran into contact and a scrum was called in Australia’s favour near the sideline. It was immediately evident that England would try to wheel the scrum towards the sideline, to prevent the ball getting out to Australia’s backs. It became incumbent upon Ewen McKenzie to be the cornerstone of the scrum for Australia, because all the pressure applied by the English scrum would be on the Australian tighthead side. McKenzie did phenomenally well to anchor the scrum for Australia. Australia executed a backline move where Egerton served as a decoy, running close and just outside of Tim Horan at inside centre. As the ball passed through the Australian backs’ hands, the English fullback Jonathan Webb decided he needed to commit himself to tackling Jason Little. Little passed the ball onto to Australian fullback Marty Roebuck, inserting himself into the backline between Little and Campese, and he scored his second Test try in his second Test after 11 and a half minutes of play, under the posts. While it was a nicely worked backline move by the Wallabies, the most credit for that first try should be given to Ewen McKenzie. Lynagh converted Roebuck’s try, in front of the posts, in the 14th minute. 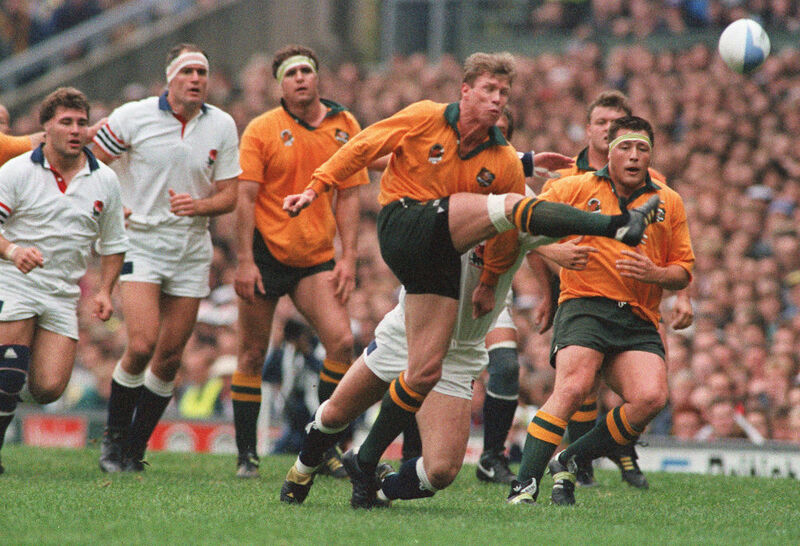 England quickly responded to Australia’s try little more than a minute following Lynagh’s conversion. The English backs executed a move bringing Oti into the play using a scissors’ pass. Oti powered over a Michael Lynagh tackle attempt, before Roebuck caught up to him and stopped him. Tim Gavin ran back to Oti and drove him backwards in a tackle, almost 10 metres! It was a terrific tackle by Gavin. The ball eventually came to Jonathan Webb, who was driven back in a tackle by Rob Egerton. Webb offloaded and England began to shift the ball wide. Underwood, standing still, palmed off a pass to Carling running around him. Carling was able to run past the outside of Jason Little and avoid his tackle to create a two-on-one against Campese, with Guscott on the outside. Campese tried to intercept the ball, but Carling threw a dummy, before offloading to Guscott. Guscott ran down the sideline and stepped inside Willie Ofahengaue, who was coming across in cover defence, to score a try in the 15th minute. It was an incredibly bizarre try that shouldn’t have been scored because it was all executed far behind the advantage line. This try exposed the Wallabies’ midfield defence. Jonathan Webb converted Guscott’s try in the 16th minute to make the score 9-6 in Australia’s favour. Shortly following Webb’s conversion, Simon Poidevin was penalised in the seventh line-out of the Test, for something the television footage couldn’t capture. However, Jonathan Webb missed the penalty, taken just inside Australian territory and on a slight angle, in the 18th minute, to keep the score at 9-6. In the 23rd minute of the Test, Australia had a scrum feed in English territory when Jeff Probyn was penalised for bringing down the scrum. It was very pleasing to see the New Zealand referee Keith Lawrence award this penalty to Australia. “This is an illegal practice, of course, and I find it astonishing that Probyn has been scrummaging illegally like this for as long as anyone can remember without ever being penalised for it,” Dwyer remarked. Lynagh kicked the penalty from the sideline in the 25th minute to give the Wallabies a 12-6 lead. Shortly after Lynagh’s penalty kick, England took a drop-out from their quarter during the 28th minute. After Australia had recovered position, Wallaby halfback Nick Farr-Jones noticed that England’s outside backs hadn’t repositioned themselves into their correct positions following the drop-out. Farr-Jones executed a wonderful kick behind England’s winger Chris Oti for Campese to chase. Campese’s anticipation and alertness to chase Farr-Jones’ kick was excellent. He out-sprinted his opponent Oti in following the ball. It appeared for a moment that England fullback Jonathan Webb would field the ball and run it into touch, however the ball took an eccentric bounce just as Webb tried to gather it, and it bounced perfectly for Campese to gather and then ground in the in-goal. 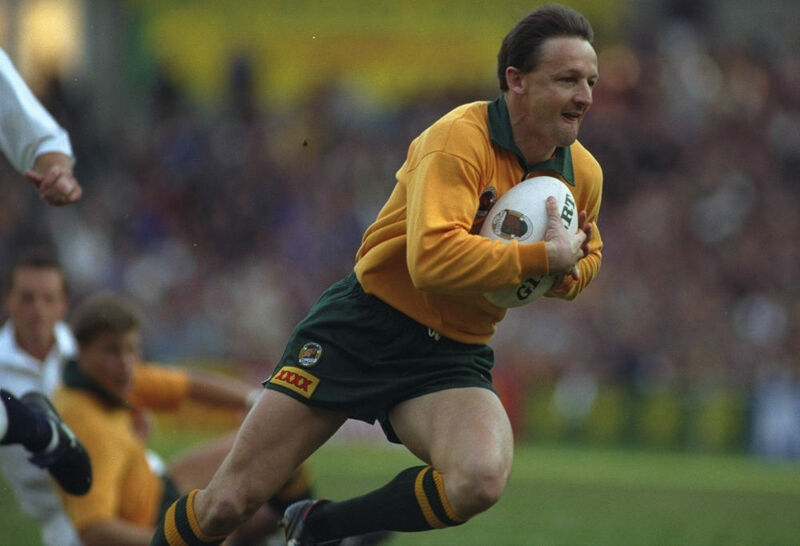 Campese scored this first try in the 29th minute, which Lynagh failed to convert in the 30th minute, giving Australia a 15-6 lead. Jeremy Guscott responded in the 32nd minute with perhaps England’s most promising period of play in the first half, when he made a phenomenal midfield break. Guscott sliced through Horan and Little, feigned a pass and ghosted past fullback Marty Roebuck, and then offloaded to England fullback Jonathan Webb. This brought play deep into the Australian quarter. After England rucked the ball back, once again the ball came to Jeremy Guscott in the midfield. Guscott tried to dribble to ball through the Australian defence and run on to the ball – in the exact same way that he did in the dying stages of the second Test between the Wallabies and Lions in 1989, to score the Test-clinching try. However, Horan impeded Guscott and blocked him from running onto the ball in the 32nd minute, giving away a penalty. Jonathan Webb kicked the penalty in the 33rd minute to make the score 9-15. Australia nearly increased their lead in the 38th minute with some incredibly inventive play from the Australian backs. Farr-Jones threw a cut-out pass to Tim Horan, who in-turn threw a long cut-out pass to David Campese on the wing. Campese stood stationary as the English defence began to swarm upon him. However, Michael Lynagh cleverly looped around Campese and took the ball from him. Lynagh raced down the sideline with Oti chasing him, and as he was confronted by England fullback Jonathan Webb, he executed a lovely chip-kick for him to run on to. Lynagh required a favourable bounce so he could re-gather the ball and simply ground it for a try. He received an unfavourable bounce and knocked the ball on. 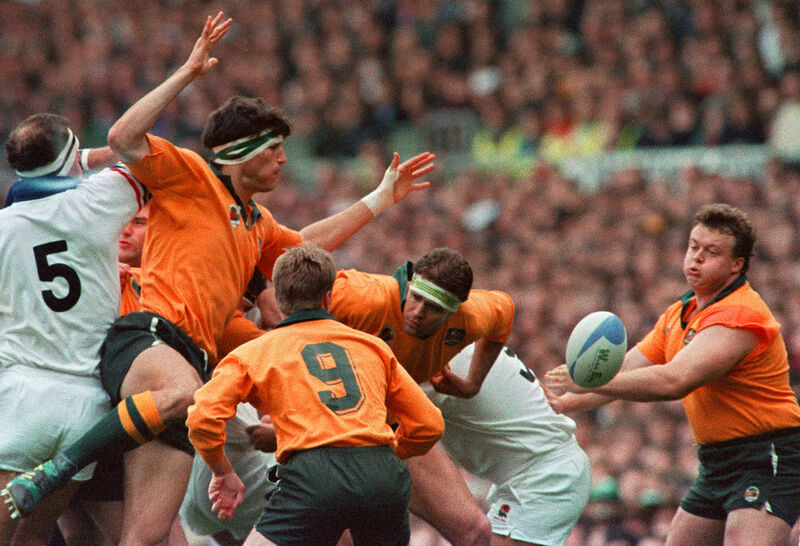 Only moments later in the 39th minute, during the last line-out of the first half, John Eales offered viewers a glimpse of his remarkable talent that rugby fans would come to enjoy for the next 10 years. Eales leapt in the line-out, but the battle for the ball was well-contested. However, Eales possessed the coordination to juggle the ball, and then tap it down in such a way to allow the ball to land exactly where he could take a chest-mark and surge through the line-out on a brief run. Unfortunately, as Eales tried to offload the ball to Gavin, it was knocked-on. “He has that ability to juggle the ball on his fingertips!” Gordon Bray added. At half-time to score was: Australia 16 – England 9. Australia restarted play in the second half scoring just after three minutes of play, and Tim Gavin commenced the game with the same form that saw him dominate the first half of play. At one point in the opening minutes, Michael Lynagh threw a dangerous pass to Tim Horan, who had Jeremy Guscott charging up towards him to tackle him. Perhaps sensing that he wouldn’t have the time to catch and pass the ball, Horan palmed the ball on to the player outside of him – Tim Gavin. The play progressed downfield after Campese executed a perfectly weighted chip-kick that stayed in play, and forced England scrumhalf Richard Hill to boot the ball into touch to prevent a Wallaby try. John Eales almost scored his first Test try from the ensuing line-out. He didn’t quite get a clean grab of the ball, but he lunged toward the English try-line after catching it. Only a strategically-placed Dean Richards leg could prevent Eales from dotting the ball down, barring him from scoring his first international try in the 42nd minute. However, moments later Australia scored a neatly executed try incorporating the backrowers and backs. The play was a double-loop from the back of a scrum. Nick Farr-Jones passed the ball to Tim Horan who was standing on the blindside from the scrum. Horan acted as the pivot of the ploy. He shaped to pass the ball to Farr-Jones who was about to loop him, but instead he passed the ball inside to Tim Gavin who was also doubling around him. Bob Dwyer explained the logic of the Wallabies’ backrow moves in Full Time: A Coach’s Memoir. What I appreciate about the play that resulted in Campese’s second try was the precision of its execution. During the 1991 Rugby World Cup final against England, Australia attempted the exact same move shortly after Campese was denied a try by an unfortunate bounce of the ball. The Wallabies tried to execute the double-loop, but the execution was poor and England were ready for it. Precision became the word associated with this Wallabies performance. “I regard that performance highly because of the precision of our play,” Dwyer later explained in The Winning Way. Lynagh converted Campese’s try from touch in the 45th minute to give Australia a 22-9 lead. Moments later in the 46th minute, Phil Kearns was penalised for handling the ball on the ground. Keith Lawrence played advantage for a short time, but brought play back in the 47th minute for a penalty. Jonathan Webb converted the penalty in the 48th minute to make the score 12-21. In the 51st minute England’s Peter Winterbottom was penalised for rushing up from an offside position and Lynagh kicked the penalty in the 53rd minute. England made a sensational midfield line-break in the 54th minute. The ball came to Will Carling. Chris Oti ran from the blind wing on a loop and Carling shaped to pass it to him. Instead he sliced through Horan and Little and ran past Poidevin. Little tried to run back and catch him, but Carling evaded him. Farr-Jones eventually brought him down and Horan fell on top of Carling. Both Farr-Jones and Carling required treatment following this tackle. Carling appeared to suffer head-damage after Tim Horan fell on him running back in cover defence. Farr-Jones, who became a father for the first time earlier that week, appeared to have aggravated a thigh-strain he took into the match. Farr-Jones eventually came off the field in the 58th minute to be replaced by University of Queensland halfback Peter Slattery. Just prior to Farr-Jones coming off the field, England gave away a penalty for “hands in the ruck” after Simon Poidevin had wonderfully pilfered a ball. However, Lynagh missed the penalty in the 59th minute when the ball hit the right upright post. During the 60th minute of the Test, Poidevin could be seen laying down in backfield holding his shoulder. However, after two years out of the Wallaby jersey, Poidevin refused to come off the field. Poidevin later revealed that he had suffered a pinched nerve in his neck, which he played through for the last quarter of the match. “He is made of granite, this man,” called Gordon Bray. Later Bray further noted that. Australia’s fourth try of the Test came in the 64th minute with a variation on the previous back row move – the double loop. This time Australia sought to utilise the openside. From the back of the scrum, replacement scrumhalf Peter Slattery passed the ball to Tim Horan, as Farr-Jones had done before. Slattery and Gavin began to loop Horan, as happened earlier. However, this time Horan shaped to pass to Gavin, before offloading to Ofahengaue, who came from around the blindside of the scrum to take the ball and commence one of his barging runs. Dean Richards missed a tackle on Ofahengaue as he powered past him, and the English scrumhalf Richard Hill didn’t fare much better either. Ofahengaue was over for the try, and I don’t think a brick wall would have stopped his run! Michael Lynagh converted Ofahengaue’s try in the 66th minute to make the score 31-12. England responded shortly after. Australian scrumhalf Peter Slattery was penalised in the 67th minute for “killing the ball” while the ball was in Australian territory. English fullback Jonathan Webb converted the penalty in the 68th minute to bring the score to 31-15. As play progressed, Jeff Probyn was penalised in the 70th minute on the halfway line for coming around a ruck from an offside position. Lynagh’s attempted penalty kick in the 72nd minute hit the lower part of the right upright post. Then… another John Eales moment! The ball bounced back into play and came to England eightman Dean Richards. Who was it that tackled Richards first? John Eales! Eales had outsprinted every other Australian player from the halfway line, all the backs and loose forwards, to be the first person to tackle Dean Richards. In the 75th minute of the Test, Jeremy Guscott gave away a penalty in front of Australia’s goal. Guscott tackled Horan well, but then preceded to “kill the ball” – contesting it while never getting to his feet. Lynagh kicked the penalty in the 76th minute to give Australia an unassailable 34-15 lead. With less than five minutes remaining in the Test, there was time remaining for one last Australian score. Rob Andrew restarted play by kicking-off long to Campese inside the Australian 22. Campese launched a massive riposte by finding touch just outside the English 22! What’s even more impressive is that Campo didn’t have a great angle to work with! England were penalised in the ensuing line-out in the 77th minute when Ackford pushed McCall out of the line-out. The crowd, who moments earlier were chanting “boring”, demanded that Lynagh not go for goal, and with the Test out of reach for England, Noddy was happy to oblige them! Lynagh launched a high “up and under”. English flanker Peter Winterbottom, with his back to the Australians, tried to catch the ball but he knocked it backwards, and Australia recovered the ball from a ruck. Things almost came unstuck when scrumhalf Slattery attempted a sniping run, only to run directly into English contact. The ball should have gone out to the backs. However, from the ensuing ruck the Tongan Torpedo, Willie Ofahengaue, picked up the ball and burst over the ruck with tremendous power, to score his second try in the 77th minute of the Test. Ofahengaue’s try was also made possible by excellent clearing out work by Eales and Daly. It was somewhat reminiscent of two offensive linemen clearing a path for the running back to explode into. Lynagh converted Ofahengaue’s try in the 78th minute of the Test to give us the final score of the Test. Australia defeated England by 40 points to 15 in one of the greatest performances displayed by an Australian rugby union team. There is a common belief that the reason why England attempted to play expansive running rugby during the 1991 Rugby World Cup final was because they attempted a 10-man forward-oriented style of rugby in Sydney earlier that year without success. One statistic is enough to debunk this common misconception. In the first half of this Test, England flyhalf Rob Andrew only kicked the ball once! England played expansive rugby in this Test! Will Carling and Jeremy Guscott often found their way through the Wallabies’ midfield, and this makes me think this may have influenced England’s strategy for the Rugby World Cup final. “We expected the Englishmen to try and attack through our midfield as they had done with limited success in Sydney earlier in the year,” Bob Dwyer wrote in The Winning Way. The only part of Australia’s performance that could be criticised was their midfield defence. This is ironic because this was unquestionably the outstanding aspect of the Wallabies’ victory over England in the 1991 World Cup final. I wonder what effect the selection of Simon Poidevin had on England’s game-plan. Poidevin played most of his career at blindside flanker, and was a more defensive-style of openside flanker, suited for counter-attacking a tighter forward-oriented style of attack. In the 54th minute of the Test, Will Carling made a sensational run by breaking inside Tim Horan, and sweeping past Lynagh and an attempted Poidevin tackle. In the 69th minute, Jason Little was tackled and England’s openside flanker Peter Winterbottom easily made it to the breakdown before any Australian back-rowers did. Poidevin played an excellent game and Dwyer’s selection of him was, I think, vindicated. However, I think England changed their style of attack because of the composition of Australia’s backrow. Tim Gavin was the best player on the field. When you consider that the Wallabies produced perhaps their greatest performance in history, and that Gavin was most people’s choice for best player on the field, I don’t see how this can’t be rated one of the 10 best performances by a Wallaby player in history. Gavin had one of those special days where he happened to be everywhere! He was catching balls that ricocheted off Egerton or were palmed down by Horan. He was involved in Australia’s successful try-scoring backrow moves. He constantly acted as a link between forwards and backs. His breakdown work was incredible, and he served a useful line-out target in the second half. John Eales was the second best player on the field and the best player of the first half. Australia won 10 of the 15 line-outs in the first half. Eight throws went to number four in the line-out, and Eales defeated the 210cm Martin Bayfield eight times! Eales’ workrate around the field was astonishing – from re-gathering the ball from kick-offs, restarts, and making big tackles, etc. This was only his second Test cap! Willie Ofahengaue was the best player of the second half. He scored two great tries and his power-running caused tremendous problems for the English. He possibly emerged as the foremost ball-carrier in world rugby in this Test. Campese scored two tries. Yet his defence was the most impressive aspect of his play. He brought Chris Oti down with low tackling in the 3rd, 31st, 35th and 36th minutes. Beyond that, Campese did so many little things well in this Test that it’s obvious that mind and body were in harmony with one another – a foretaste of his wonderful World Cup to come. Farr-Jones set up two tries – one with a kick and the other with a pass. He left the field in the 58th minute, but played a good game. Both McKenzie and Daly had excellent games. Australia’s first try was made possible because McKenzie absorbed England’s scrum pressure on the tighthead side. Daly did well against Probyn, and the referee was willing to penalize Probyn when he pulled downward on Daly’s sleeve. The beautiful backrow moves that Australia executed are impossible to perform if the front-row doesn’t provide a solid platform. Lastly, Lynagh’s general play and goal-kicking was first class. For Australian coach Bob Dwyer, the Wallabies’ resounding victory was a serving notice to the rest of the world that Australia was to be a serious contender at the 1991 Rugby World Cup. “We won 40 to 15, a result which I think stunned people in the English camp,” Dwyer later wrote. While Australia would go on to win the World Cup, it could be argued that the moment they became the number one rugby side in the world, reigning for years to come, was several months earlier when they comprehensively defeated the best rugby team in Europe with quite possibly the best team performance in Australian rugby history.